I've only been cooking duck for a few years now as it was never something I ate growing up. My wife and her Mom love it though so I've been trying to get my technique down. One benefit is the more I experiment with it the more I enjoy it. Making sous vide duck is a good, hands off way to prepare great duck every time. I ordered some duck from D'Artagnan, because our local stores don't carry anything that looks overly appealing. I decided to go with simple seasonings so I used some cumin and ancho powder with salt and pepper. Then I cooked it at 135°F / 57.2°C for a few hours. Once the duck was done cooking I removed it from the water bath. Because I love a crispy exterior I quickly chilled the sous vide duck in a ½ ice - ½ water bath and refrigerated them. Then when I seared them I had more time to develop the crust without cooking the middle of the duck any further. 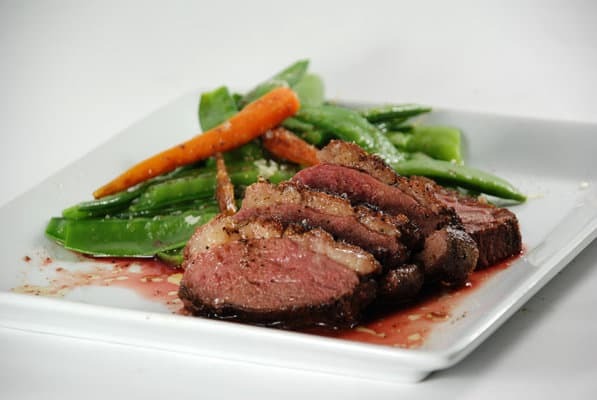 Once it was seared I cut the sous vide duck into 1/2" slices and served it with some carrots and pea pods fresh from our garden. The peas and carrots were blanched in boiling water until tender and quickly chilled. I served the vegetables cold with some good olive oil drizzled over them and some smoked Maldon salt. Preheat the water bath to 135°F / 57°C. Salt and pepper the duck and sprinkle with the cumin and ancho chile powder. Place the duck in the sous vide pouch and seal. Place in the water bath and cook the sous vide duck for 2 to 4 hours. When the sous vide duck is done cooking remove it from the water bath and cool in a ½ ice - ½ water bath until chilled. Refrigerate until you are ready to sear and serve it. Pre-heat a pan to medium-high heat when you are ready to eat. Remove the sous vide duck from the pouch and pat dry. Score the duck fat in a diamond pattern. When the pan is heated place the duck in it and sear it, turning every few minutes until the duck has a nice crust on it and is heated through.